A plan to build 12 new condos on Ann Arbor’s west side has again been postponed by city planning commissioners. The vote to postpone, taken at the commission’s July 1, 2014 meeting, was unanimous. 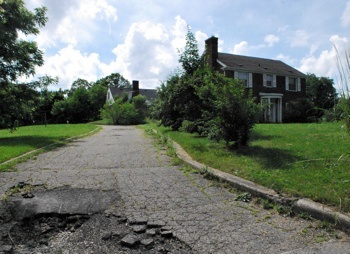 The project at 312 Glendale, south of Jackson Avenue, had been previously postponed a year ago at the planning commission’s July 16, 2013 meeting. That meeting had drawn about an hour of commentary from residents who raised concerns about the project, including increased flooding, the lack of pedestrian access, increased traffic and the loss of landmark trees. 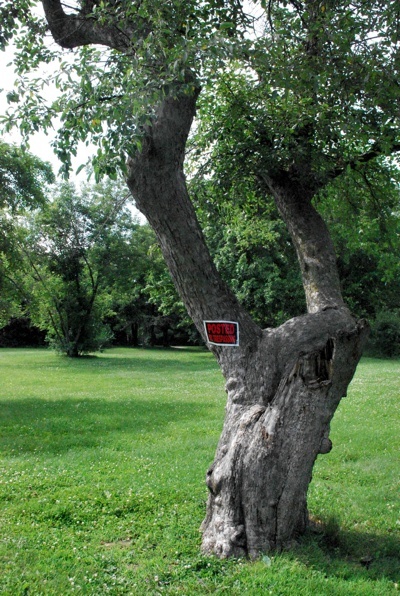 The site, owned by Jeffrey Starman, includes a former orchard. 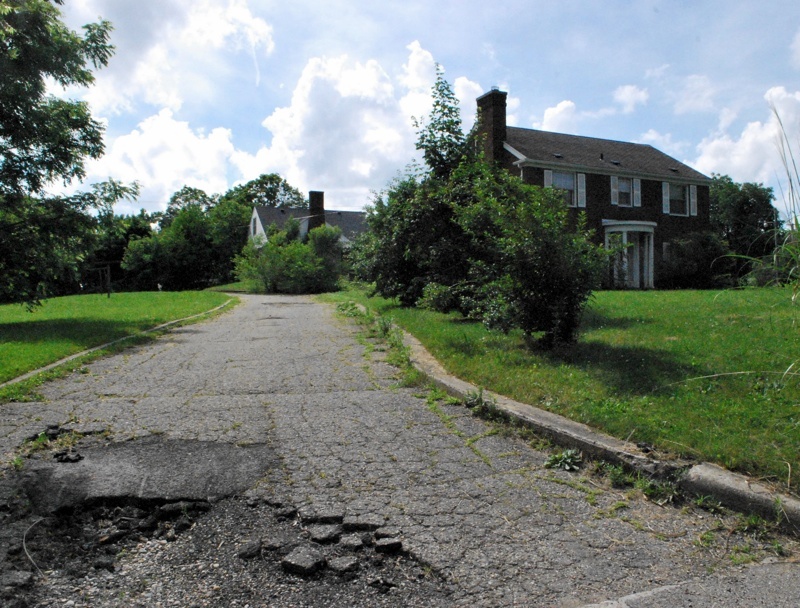 The project has been scaled back since then – but still drew considerably opposition. The plan now calls for six duplexes, each with two two-bedroom condos. (The original proposal had been for eight duplexes.) Based on the size of the parcel and the site’s zoning, up to 39 units would be allowed by right. Each unit would include two garage parking spaces, with 12 additional surface spaces on the site. That’s double the number of spaces required by zoning. Sixteen of the 23 landmark trees would be removed, and 103 new trees would be planted. 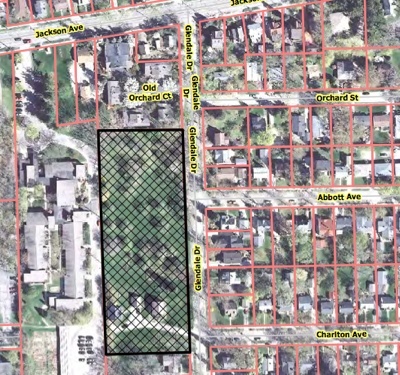 The developer also agreed to make a voluntary $7,440 contribution to the city’s parks system. A public sidewalk would be built along Glendale. There would also be pedestrian connection between two buildings on the site, connecting the drive and the new public sidewalk on Glendale. Another sidewalk connection would be built between the end of the east/west portion of the drive and the Hillside Terrace property to the west. Regarding stormwater management, the development agreement requires that the developer pay for disconnecting three footing drains from residences in the nearby neighborhood. On the site itself, the proposal called for stormwater facilities to be located on either side of the entrance driveway – an underground basin on the north, and a surface detention pond on the south. The intent is for any stormwater runoff to be captured within the site, and not to affect the surrounding neighborhood. The public hearing on this project at the July 1 meeting drew 22 speakers – the project’s architect, and 21 residents who were opposed to the development. Issues that were raised were similar to those expressed a year ago, and included concerns about increased flooding and other stormwater problems, dangers of the proposed detention pond, increased traffic, and a loss of landmark tress and green space. It was the detention pond that drew most concern from commissioners. Wendy Woods said the potential danger it posed would prevent her from supporting the project. Ken Clein questioned the contention of the architect, Scott Bowers, that the pond had been mandated by the office of the Washtenaw County water resources commissioner. Clein and other commissioners asked planning staff to get more information from the water resources commissioner about whether there are other options to handle all of the site’s water detention – such as additional underground systems. The water resources commissioner is Evan Pratt, who formerly served on the Ann Arbor planning commission. Aerial view of the Glendale condominium site. Trees in the former orchard at 312 Glendale are marked with No Trespassing signs. A year ago, both Ward 5 city council representatives attended the planning commission meeting when this project was brought forward, and one of them – Chuck Warpehoski – was among the speakers at that public hearing. He was cut off at that meeting by commissioner Diane Giannola, who cited the commission’s bylaws: “A member of the City Council shall not be heard before the Commission as a petitioner, representative of a petitioner or as a party interested in a petition during the Council member’s term of office.” Warpehoski, who’d been unaware of that rule, stepped away from the podium. That incident prompted additional discussion of that section of the bylaws, which were ultimately revised in an attempt to clarify the ability of councilmembers to address the commission. The planning commission approved a bylaws revision at its Feb. 20, 2014 meeting. The changes also require city council approval. However, the city attorney’s office is still reviewing the revisions and they have not yet been forwarded to the council.